A very brief post this week to highlight the dangers of unseasonably warm weather early in the season. February 2019 has entered the record books as the first ‘winter’ month in which the temperature exceeded 20°C (on at least the 25th and 26th in the UK). It’s also been a record with the daily temperature (highs … we’ve had some hard frosts as well) exceeding the historic average daily temperature on almost every day of the month. Even here in Fife on the East coast of Scotland, the weather has been very warm and sometimes even sunny. The graph above shows the daily maximum temperature compared to the monthly average (dashed line). The contrast with this time last year is very striking. The big winter storm called Anticyclone Hartmut (aka the Beast from the East) arrived in the last week of February. We had six foot deep snow drifts blocking the road to the village and there wasn’t a bee to be seen. Fast forward exactly 12 months and the bees are piling in the pollen and flying well for an extended period. Around here this early pollen probably comes from crocus, snowdrop, hazel and alder, perhaps with a bit of gorse as well which flowers throughout the season. Brood rearing will have started in earnest. The large amounts of pollen being collected is a pretty good indicator that all is well in the hive, that the queen is starting to ramp up her egg laying rate and the numbers of hungry larvae are increasing. There’s no need to open the hive to check for brood. Indeed, hive inspections (here at least) are probably at least 6 weeks away. However, don’t ignore the colonies. The increase in brood rearing is a time when stores levels can quickly get critically low. There’s not a huge range of nectar sources about at the moment and the combination of a warm spell, increasing amounts of brood and a subsequent deterioration in the weather can rapidly result in colonies starving. 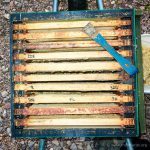 If you’ve been regularly hefting the hive to check its weight you should have a reasonable ‘feel’ for what it should be, and whether it’s significantly lighter. More accurately, but also more trouble, you can use luggage scales to record the week-by-week reduction over the winter. It’s possible to determine whether there are sufficient – or at least some – stores by looking through a perspex crownboard at the tops of the frames. 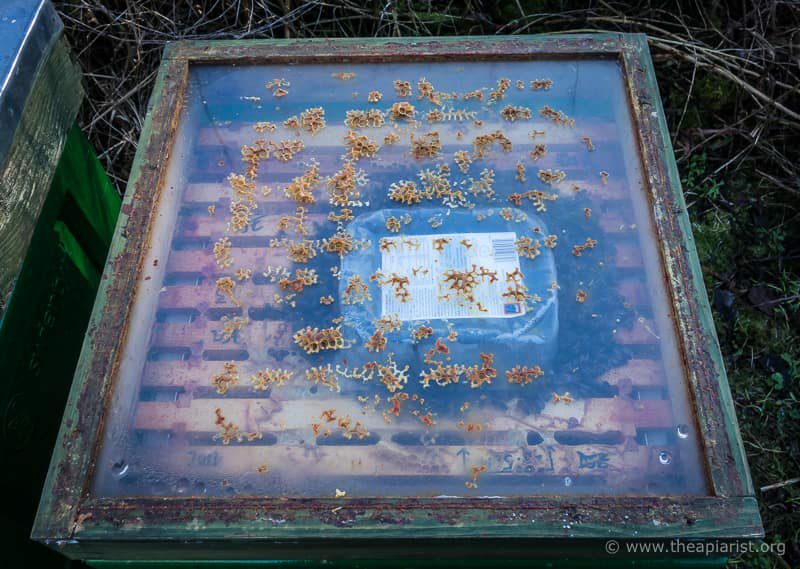 Many of my hives went into the winter with the remnants of the autumn-fed fondant still present on the top bars. With a perspex crownboard it’s a trivial task to check if these stores have been used and – if they have – to heft the hive to see if they need more. Several hives have already had a fondant topup of about a kilogram placed directly onto the top of the frames. Alternatively, the hives with the Gruyere-like Abelo crownboards 1 get a fondant block slapped directly over the hole above the most concentrated seams of bees. Fondant absorbs moisture from the atmosphere so you need to protect the faces of the fondant block not accessed by the bees. There are all sorts of ways to do this. A strong plastic bag with a slot or flap cut in the bottom is more than adequate. Better still is to dole out the fondant into plastic food containers you’ve diligently saved all year. These are reusable, come in a variety of sizes and – ideally – are transparent. You can then easily see when and if the bees need a further topup. 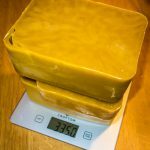 I usually slice up a block of fondant and fill these food containers in midwinter, wrap them in clingfilm and carry them around in the back of the car for my occasional apiary visits. 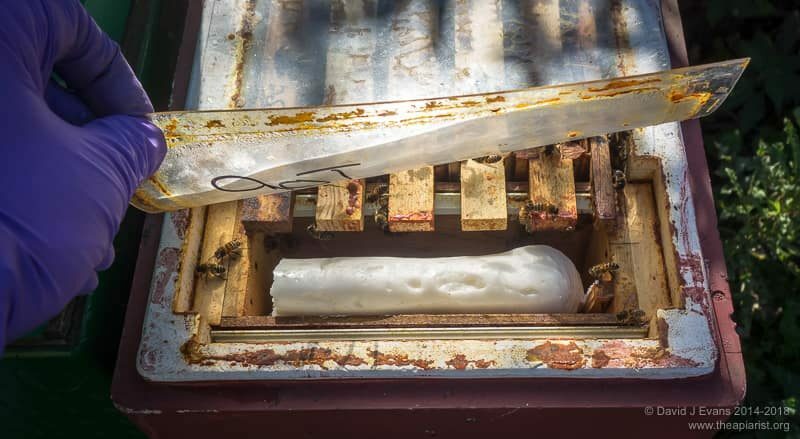 If a hive needs more stores I remove the clingfilm and simply invert the container over the bees. Do remove the clingfilm! Bees tend to chew it up and drag it down into the brood nest, often embedding it into brace comb. It can be a bit disruptive during cool weather early-season inspections to remove it … hence the suggestion to use a strong plastic bag earlier. Most of my hives will have had at least a kilogram of fondant by the end of February this year. One or two are likely to have had significantly more. I’ll keep a note of these in my records as – all other things being equal – I’d prefer to have frugal bees that don’t need fussing with over the winter. As the days get longer and the season continues to warm the queen will further increase her laying rate. Until there are both dependable foraging days and good levels of forage there remains the chance of starvation. Colonies are much more likely to starve in early spring than in the middle of a hard winter. If the latter happens it’s either due to poor winter preparation or possibly disease. However, if they starve in early spring it is probably due to unseasonably warm weather, a lack of available forage, increasing levels of brood and a lack of vigilance by the beekeeper. If a colony is worryingly light don’t wait for a warm sunny day to feed them. Adding a block of fondant as described above takes seconds. If a colony needs stores add it as soon as possible. If it’s cold the bees will be reasonably lethargic and you may not even need to smoke them. I’ve only fired up the smoker once … to topup a colony of psychotic monsters ‘on loan’ from a research collaborator who shall remain nameless. 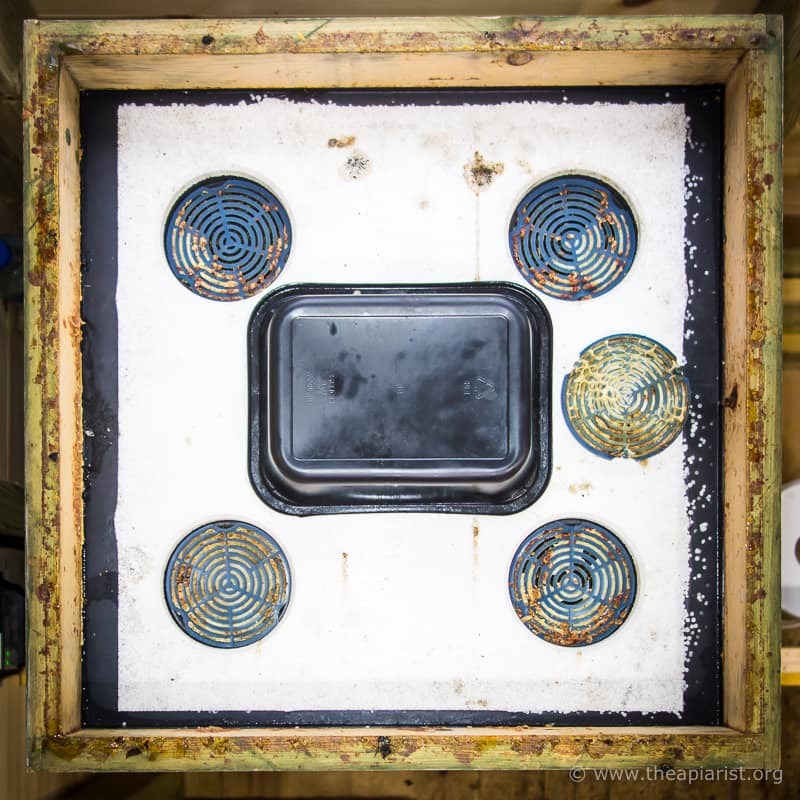 This entry was posted in Beekeeping, Feeding, Seasonal on March 1, 2019 by David. Actually, there’s no evidence that bees display or perceive most of the emotions often attributed to them 1. Whether it makes the bees happy or not, beekeepers have a responsibility to look after the health of their livestock. This includes controlling Varroa numbers to reduce the levels of pathogenic viruses in the hive. How well are virus levels controlled if mite levels are reduced? The 2018 autumn was relatively mild through until mid/late November. In the absence of very early frosts colonies continued rearing brood. We opened colonies in mid-November (for work) and found sealed brood, though it was clear that the laying rate of the queen was much-reduced. These are ideal conditions for residual mite replication. Any mites that escaped the late summer/early autumn treatment (the ideal time to treat to protect the overwintering bees) continue to replicate, resulting in the colony starting the following season with a disappointingly high level of mites. I’ve noted before that midwinter mite levels are paradoxically higher if you treat early enough in the autumn to protect the all-important winter bees. Consequently, to start the year with minimal mite levels, I treat in midwinter with a trickled or vaporised oxalic acid-containing (OA) treatment. A combination of colder weather (hard frosts in late November) and brood temperature measurements 2 indicated mid-December was a good time to treat. In one of my apiaries ten colonies were treated. Some were definitely broodless (based upon Arnia hive monitoring). Others may have had brood, but colonies were not routinely checked. Over the four day period after vaporising these ten colonies dropped a total of 92 mites. More than 50% of these were from just one double-brooded colony. Overwintering nucs 3 dropped no mites at all in the 12 days following treatment. This was very encouraging. These are lower midwinter mite levels than I’ve seen since returning to Scotland in 2015. 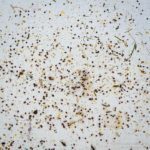 The one colony with ‘high’ mite levels received two further treatments (on the 22nd and 27th) in an attempt to minimise the mite levels for the start of the season. Going by the strength of the colony and the debris on the Varroa tray it was presumed that this colony was still rearing brood. Mite drop following the third treatment was negligible 4. Why are mite levels so low? Very tight control of mite numbers in the 2017/18 season, primarily by correctly timing the winter and the late-season autumn treatments. This is simply good colony management. Anyone can achieve this. A brood break midseason and/or a broodless period when splitting colonies (both give opportunities for more phoretic mites to be lost through grooming). Undoubtedly beneficial but season-dependent. I’ll be discussing ways to exploit these events in posts next year. A low density of beekeepers in Fife, so relatively little drifting or robbing of poorly managed colonies from neighbouring apiaries. Geography-dependent. Much easier in Fife than Warwickshire … and easier still in Lochaber. And what do less mites mean? Varroa is a threat to bee health because it transmits pathogenic viruses when feeding on developing pupae. The most important of these viruses is deformed wing virus (DWV). Generally, the higher the level of infestation with mites, the higher the viral load 5. This has been repeatedly demonstrated by studies from researchers working in the UK, Europe and the USA. 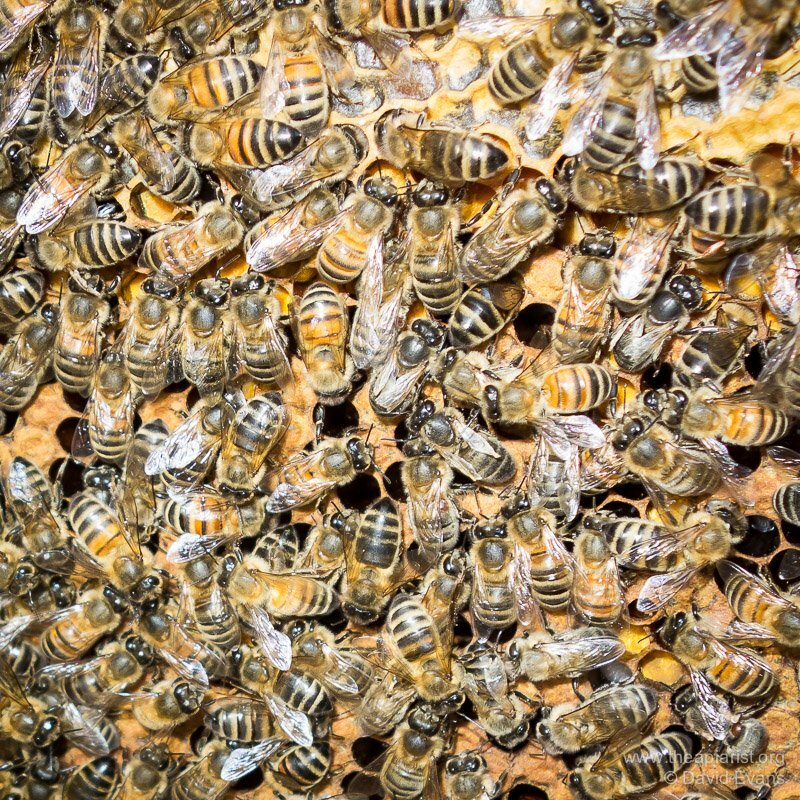 It is well-established that colonies with high viral loads have an increased chance of dying overwinter, due to the decreased longevity of bees infected with high levels of virus. 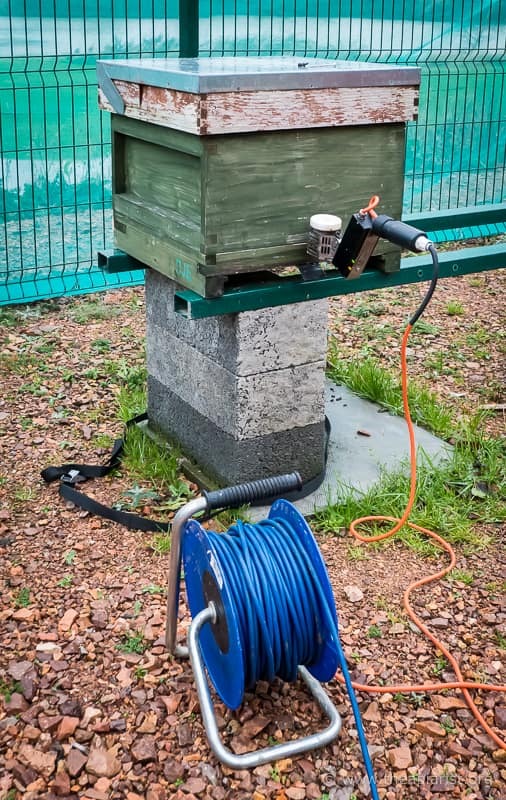 In our work apiaries we regularly measure DWV levels. For routine screening our limit of detection is around 1,000 viruses per bee. We don’t actually count the viruses. They’re too small to see without an electron microscope 6. Instead, we quantify the amount of the virus genetic material present 7, compare it to a set of standards and express it as ‘genome equivalents (GE)’. Many of the bees tested this year contained ~103 (i.e. 1000) GE, which is extremely low. Bees from Varroa-free regions (e.g. Colonsay) carry similar levels of DWV. Most of our colonies were at or close to this level of virus much of the 2018 season. This is 100-1,000 times lower than we often see even in apparently perfectly healthy colonies in other years or other apiaries. For comparison, using the same assay we usually detect about 1010 (ten billion) DWV GE per bee in symptomatic adult bees from heavily mite-infested colonies. It’s worth remembering that the purpose of treating a colony with miticides is to reduce the transmission of viruses between bees. This transmission results in the amplification of DWV. This is why the timing of treatments is so important. Yes, it’s always good to slaughter a few (or a few thousand 🙂 ) mites. However, far better massacre them when you need to protect particular populations of bees. This includes the overwintering bees, raised in September, that get the colony through to the Spring. Remember also that it ‘takes bees to make bees’ i.e. the rearing of new brood requires bees. Therefore strong colony build-up in Spring requires healthy workers rearing healthy brood. This is why it’s important to minimise mite levels in midwinter when colonies are broodless. 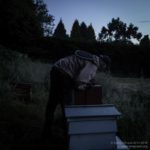 What do most beekeepers do? 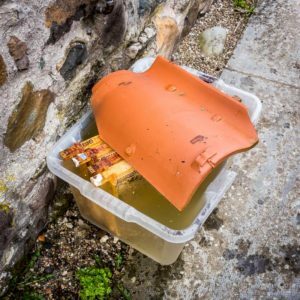 Fifteen months ago I published a post on the preparation of oxalic acid solutions for trickling colonies in midwinter. Whatever the vapoholics on the online forums claim, trickling remains the easiest, quickest and least expensive way to treat colonies in midwinter 8. The best time to treat in the winter is when the colony is broodless. Here in Fife, and often elsewhere, I believe that this usually occurs earlier in the winter than many beekeepers treat (if it happens at all … or if they treat at all). I usually treat between the end of the third week in November and mid-December, at the end of the first extended cold period. 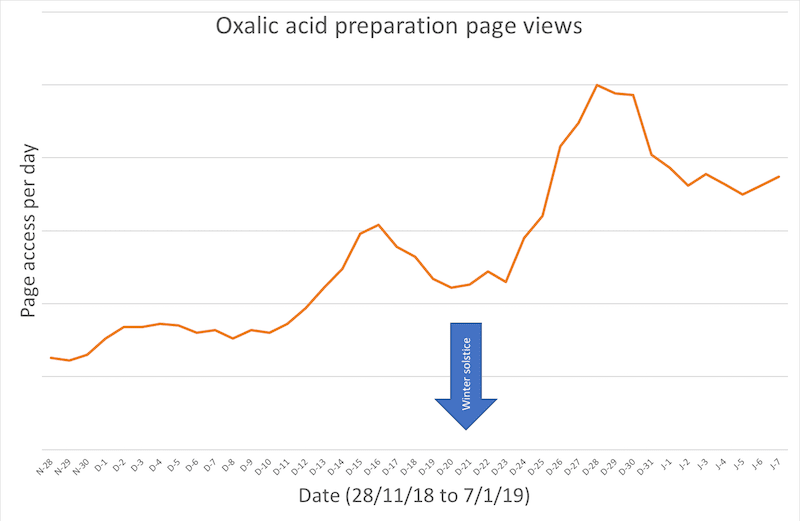 Looking at the page views for these oxalic acid recipes it looks as though many beekeepers treat after Christmas 9 … which may be suboptimal if colonies had a broodless period and now started rearing brood again. This winter has been quite mild (at least at the time of writing) so there may yet be opportunities to treat really effectively during a broodless period. This entry was posted in Beekeeping, Science, Seasonal, Varroa and tagged Better late than never, Oops I forgot, too little too late, What mites? on January 11, 2019 by David. 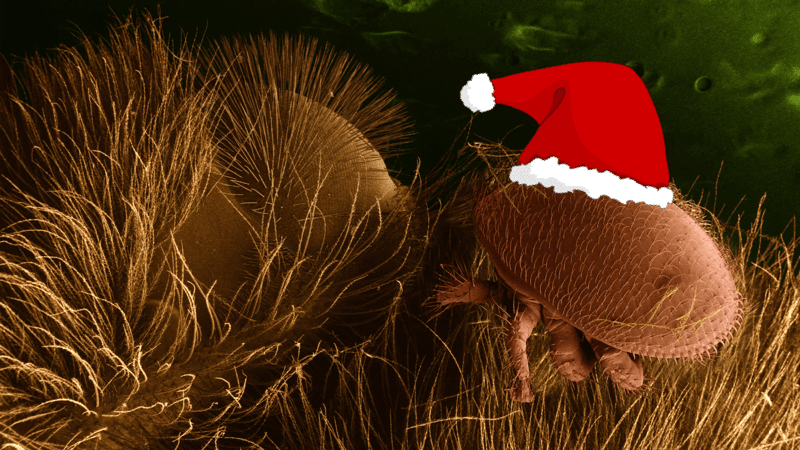 What less appropriate time is there, as we enter the festive season of goodwill, to provide a brief account of the incestuous and disease-riddled life cycle of the Varroa mite? Varroa is the biggest enemy of bees, beekeepers and beekeeping. During the replication cycle the mite transfers a smorgasbord of viruses to developing pupae. One of these viruses, deformed wing virus (DWV), although well-tolerated in the absence of Varroa 1, replicates to devastatingly high levels and is pathogenic when transferred by the mite. Without colony management methods to control Varroa, mite and virus replication will eventually kill the colony. I’ve written extensively on ways to control Varroa. Most of these have focused on early autumn and midwinter treatment regimes. However, next season I’m hoping to discuss some alternative strategies and will need to reference aspects of the life cycle of Varroa … hence this post. Varroa destructor is a distant relative of spiders, both being members of the class Arachnida … the joint-legged invertebrates (arthropods). It was originally (and remains) an external parasite (ectoparasite) of Apis cerana (the Eastern honey bee) and – following cross-species transfer a century or so ago – Apis mellifera, ‘our’ Western honey bee. 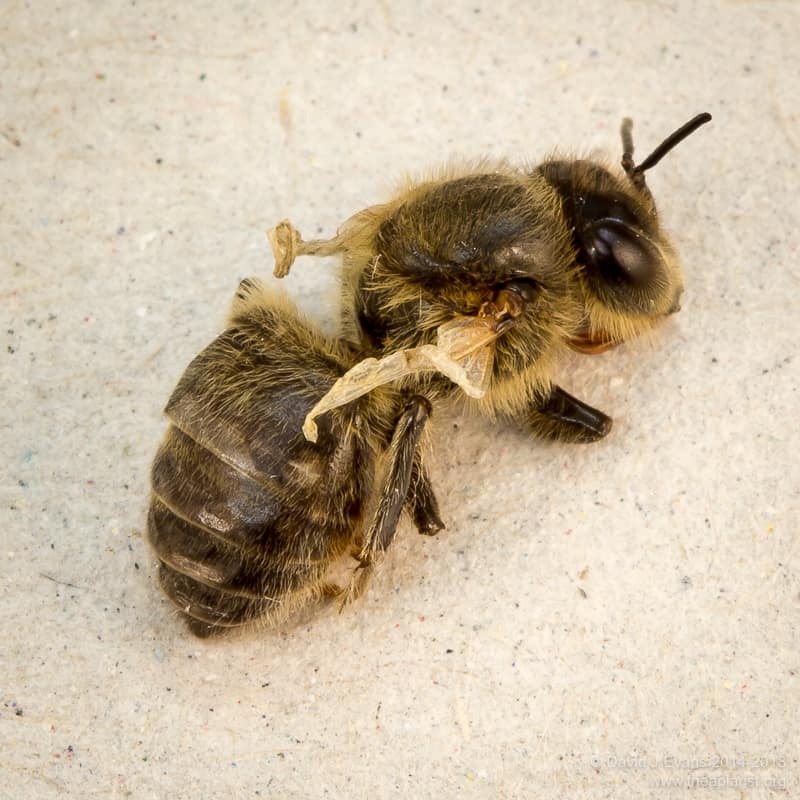 Apis cerana, having co-evolved with Varroa, has a number of strategies to minimise the detrimental consequences of being parasitised by the mite. Apis mellifera doesn’t. Simple as that 2. One hundred years is the blink of an eye in evolutionary terms and, whilst there are bees that have partial solutions – largely behavioural (small colonies and very swarmy) – they’re probably unable to collect meaningful amounts of honey 3. Varroa-resistant honey bees will probably evolve (as much as anything is predictable in evolution) but not in my time as a beekeeper … or possibly not until Voyager 2 leaves the Oort Cloud 4. Varroa has no free-living stage during the life-cycle. The adult mated female mite exhibits two distinct phases during the life-cycle. It has a phoretic phase on adult bees and a reproductive phase within sealed (‘capped’) worker and drone brood cells. Male mites only ever exist within sealed brood cells. I’m going to discuss phoretic mites in a separate post. I’ll concentrate here on the replication cycle. The mated female mite enters a cell 15-50 hours before brood capping. Drone brood is chosen preferentially (at ~10-fold greater rates than worker brood) and entered earlier. Depending upon the time of the season and the levels of mites and brood, up to 70-90% of mites in the colony occupy capped cells. The first egg is laid ~70 hours after cell capping. This egg is unfertilized and develops into a haploid male mite. Subsequent eggs are fertilised, diploid, and so develop into female mites. These are laid at ~30 hour intervals. Worker and drone brood take different times to develop. Therefore a typical reproductive cycle involves five eggs being laid in worker brood and six in drone brood. Not all of these eggs mature, their development being curtailed by the bee emerging as an adult. The foundress ‘mother’ mite and her progeny all share a single feeding hole through the cuticle of the developing pupa. What a lovely scene of family ‘togetherness’. Male and female mites take 6.6 and 5.8 days respectively to develop to sexual maturity. Therefore the male mite reaches sexual maturity before the first of his sisters. He then lurks around the attractive-sounding “faecal accumulation site” and mates with each of the (sister) females in turn. Male mites are short lived and the eclosion of the adult worker or drone curtails further mating activity, releasing the foundress mite and the mated mature daughters 6. 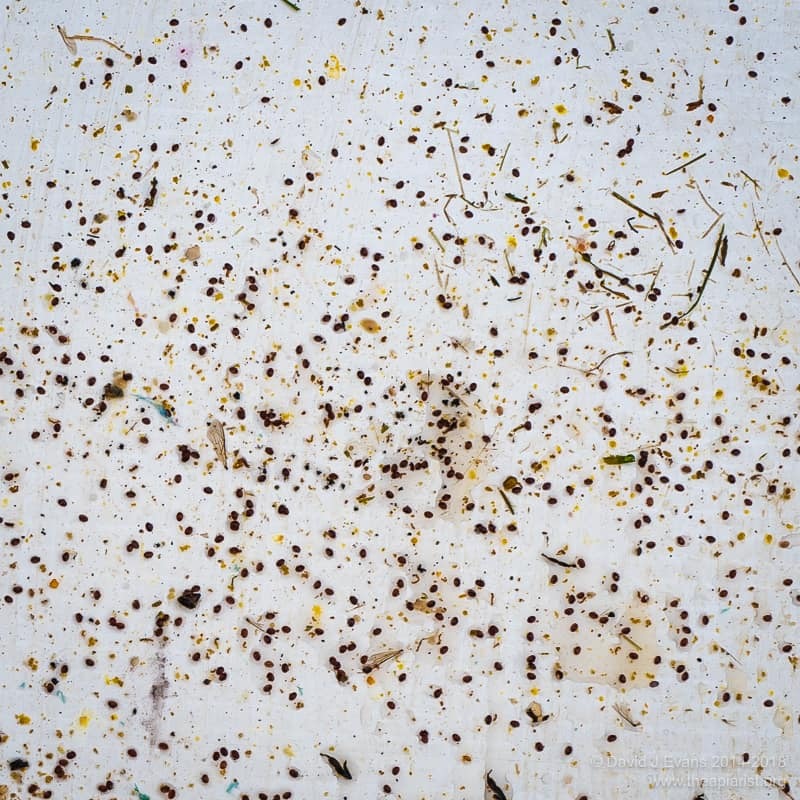 The three day difference in the duration of worker and drone development means that more mites are produced from drone cells than worker cells. Depending on conditions the reproductive rate is 1.3 – 1.45 in worker brood and 2.2 – 2.6 in drone brood. Remember that the foundress is also released from the cell. She can go on to initiate one or two further reproductive cycles (or up to 7 in vitro). Consequently, the average yield of mature, mated female mites from worker and drone cells is a fraction over 2 and 3 respectively. Before entering a fresh cell containing a late stage (5th instar) larva the newly-mated mites need to mature. They do this during the phoretic phase which lasts 5-11 days. 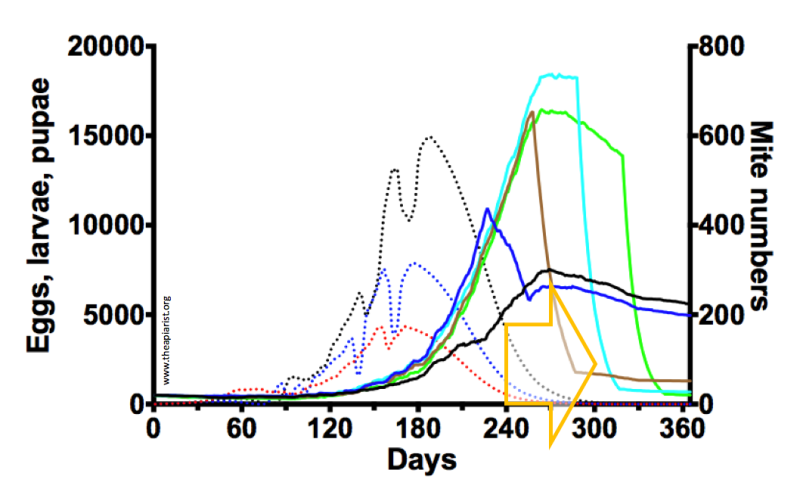 Therefore the full replication cycle of the mite probably takes a minimum of about 17 days. Two to three mites per infested cell doesn’t sound very much. However, under ideal conditions this leads to exponential growth of the mite population in the colony. Assuming 10 reproductive cycles in 6 months, a single mite would generate a population of >1,000 in worker brood and >59,000 in drone brood 7. Fortunately (for our bees, not for the mites), ideal conditions don’t actually occur in reality. Lots of things contribute to the reduction in reproductive potential. For example, only 60% of male mites achieve sexual maturity due to developmental mortality, drone brood is only available at certain times in the season, brood breaks interrupt the availability of any suitable brood and grooming helps rid adult bees of phoretic mites. However, these reductions aren’t enough. Without proper management mite levels still reach dangerously high levels, threatening the long-term viability of the colony. In the next few months I will discuss some additional opportunities for reducing the mite population. In the meantime, as we reach the winter solstice, colonies in temperate regions may well be broodless and – as emphasised last week – this is an ideal time to apply a midwinter oxalic acid-containing treatment. This will effectively reduce mite levels for the start of the coming season. Today is the winter solstice in the Northern hemisphere. This is actually the precise time when the Earth’s Northern pole has its maximum tilt away from the Sun. However, the term is usually used for the day with the shortest period of daylight and the longest period of night. In Fife, sunrise is at 08.44 and sunset at 15.37, meaning the day length is 6 hours and 53 minutes long. With increasing day length queens will start laying again … but there’s a long way to go until winter is over. This entry was posted in Science, Seasonal, Varroa and tagged life cycle, mite variation, phoretic on December 21, 2018 by David. It’s cold and dark and all is quiet in the apiary. Hives appear somnolent. Colonies are clustered 1 and, other than the odd corpse or two on the landing board, I’ve not seen a bee for at least a fortnight. Based upon previous experience I suspect colonies are – or very soon will be – broodless. I usually reckon that the first extended (2-3 weeks) period of cold weather 2 in the winter is the most likely time for the colony to be broodless. In 2016/17 this was the first week in December. In 2017/18 it was just a day or two later. In both instances, when the hives were checked, they had no brood. What’s all this about being broodless? If a colony is broodless there are no capped cells in which the Varroa mite can ‘hide’. As a consequence it’s an ideal time to apply a miticide like a trickled solution of Api-Bioxal 3. There are very good reasons why a midwinter OA treatment is necessary, particularly if you treated early enough in the autumn to protect the overwintering workers from the ravages of Deformed Wing Virus (DWV). High DWV levels reduce the lifespan of bees and contribute to many (possibly most) winter colony losses. I’ve even suggested here that “isolation starvation” might actually be due to Varroa-transmitted viral disease. Early autumn treatment protects the winter bees but also leaves the long autumn for the residual mites to continue replicating. And there will be residual mites. No treatment is 100% effective. So, paradoxically, if you treated early enough in the autumn to really help protect the winter bees, your mite levels will be higher at the end of the year. Which also means they’ll be higher at the beginning of next year. Many beekeepers, for convenience, laziness or historical precedent, choose to apply the winter OA treatment between Christmas and New Year. I suspect that this is often too late. If the queen starts laying again around the winter solstice there will be sealed brood – and therefore unreachable Varroa – by the end of the month. 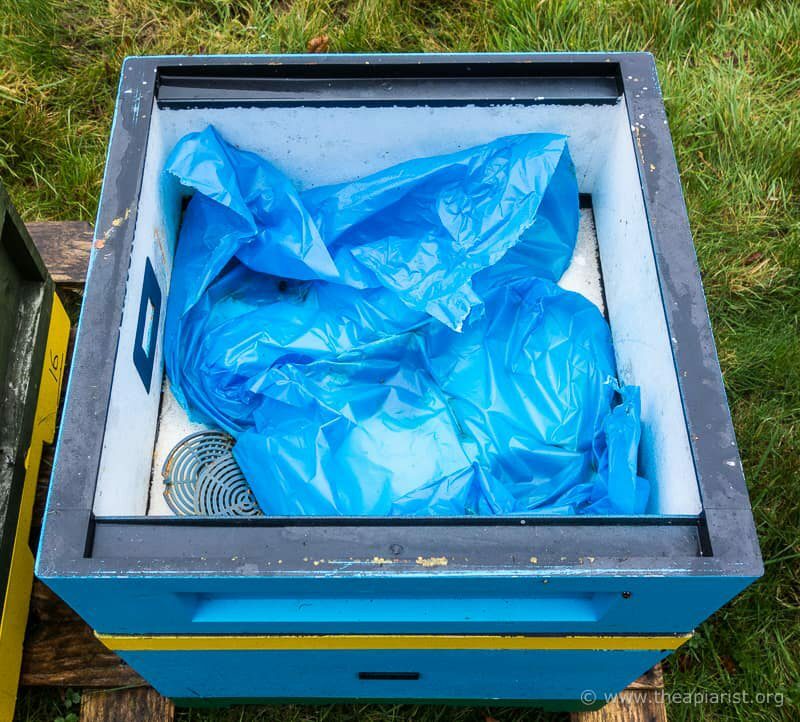 I’d prefer to have a cold and damp afternoon in the apiary slaughtering Varroa now than the convenience of treating them less effectively during the Christmas holiday period. The latter might be more convenient … the office will be closed, I’ll be replete with turkey and sprouts and it will be a good excuse to ‘escape’ visiting relatives and yet more mince pies 4. But is it the best time for your bees? We have a couple of hives with Arnia hive monitors fitted 5. These have a temperature probe inserted into the brood nest. Brood rearing temperature is around 34°C. Here is a trace of one colony over the last month. The colony temperature was pretty stable (around 33-35°C) until about the 19th of November and has dropped about 10°C since then. Although I’ve not opened the colony I think that this is additional evidence that the colony is broodless 6. 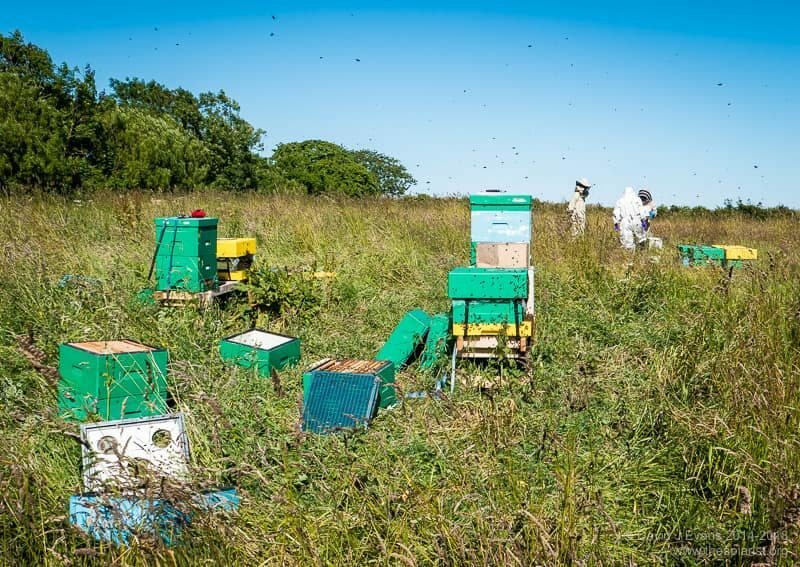 Keeping bees properly involves being aware of the seasons, the available forage and the state of the colony. This varies from month to month and year to year 7. You can’t mechanically (‘by the numbers’) add supers on the 5th of May and harvest honey on the 15th of June. Sure, it might work some years, but is it the best time to do it? Similarly, you can’t optimally treat a colony for Varroa on the 30th of December unless the climatic conditions and state of the colony coincide to make that the best time to treat. It might be, but I suspect that generally it’s a bit late if there is a brood break. If you’re going to the trouble of preparing the OA treatment, donning the beesuit and disturbing the colony you might as well do it at the right time for the bees. 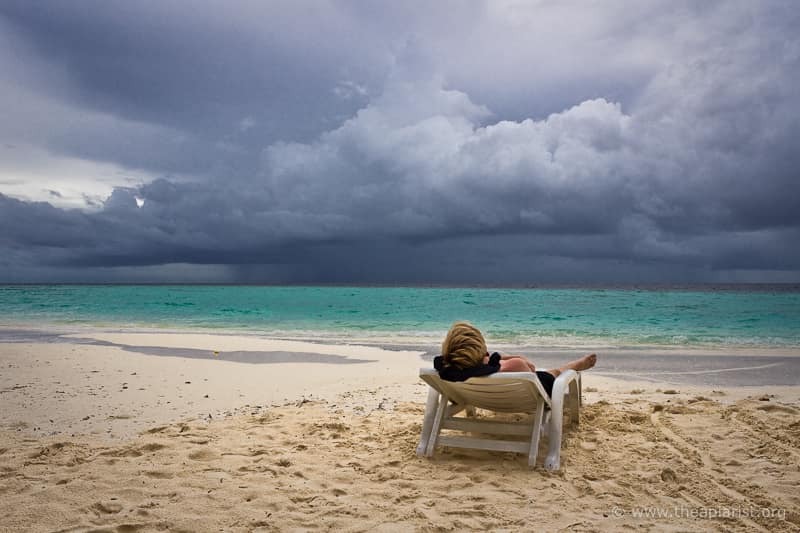 I’ll be treating in between the predicted sleet showers and sunny periods this weekend. Isn’t evolution a wonderful thing? This post started with a working title of “Know your enemy” and was on a different topic altogether. I’ll save that for next week. The above was written at the beginning of the week. Now the weekend is closer it’s clear the weather is going to be cold with heavy snow predicted. Unless the forecast is wrong (and how often does that happen?!) I’ll hold off treating until a) it’s over 5°C, and b) the roads are safe. 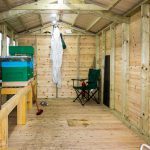 This entry was posted in Beekeeping, Diseases, Seasonal, Varroa, Varroa control and tagged brood break, Brrrr, climate, winter on December 14, 2018 by David. We’re gently but inexorably segueing into early autumn after an excellent beekeeping season. 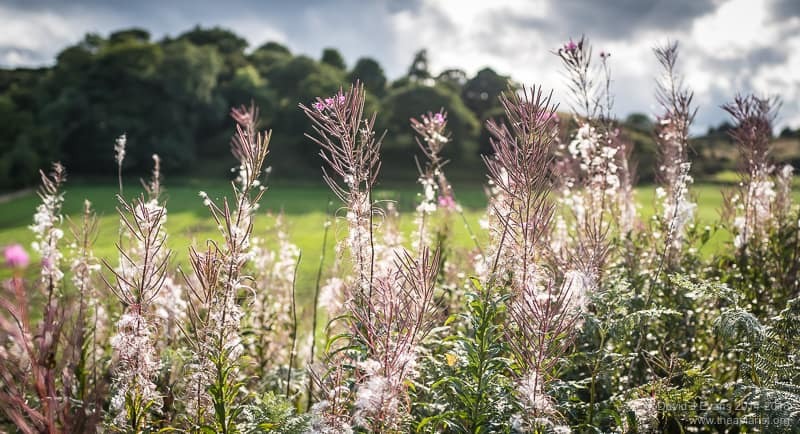 The rosebay willow herb is almost over, the farmers are busy taking in the harvest and colonies are – or should be – crowded with under-occupied workers. Drones are being ejected, wasps are persistently looking for access and there’s a long winter – or at least non-beekeeping period – ahead. There’s a poignancy now in being in the apiary conducting the last few inspections of the season. 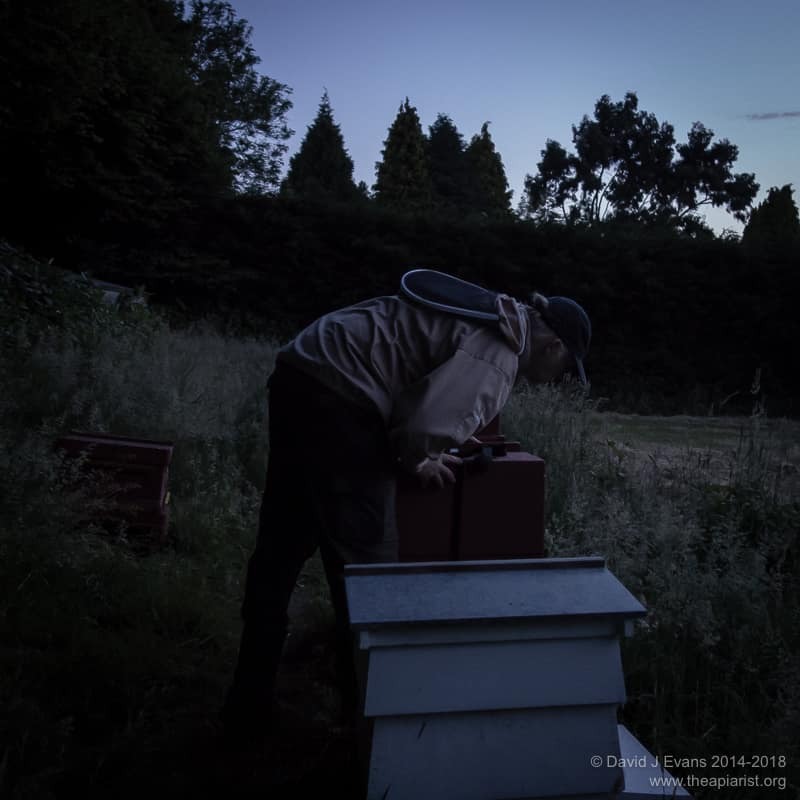 Only a few short weeks ago, during late May and early June, the apiary was a scene of frenetic productivity … or complete turmoil, depending upon your level of organisation or competence. Now there’s little activity as there’s not much forage available. Colonies are busy doing nothing. But that doesn’t mean that there’s nothing to do. Rather, I’d argue that late August and early September is probably the most important period during the beekeeping year. However well or badly the season progressed, this is the time that colonies have to be prepared for the coming winter. With good preparation, colonies will come through the winter well. They’ll build up strongly in spring and be ready to exploit the early season nectar flows. There are some colonies inspected last weekend that probably won’t get properly opened again until mid/late April 2019. Queens I saw for the first time in August won’t get marked or clipped until next spring 1. To survive the winter and build up well in the spring the colony has few requirements. But they are important. A lack of attention now can result in the loss of the colony later. To appreciate their needs it’s important to understand what the colony does during the winter. Honey bees don’t hibernate in winter. In cold weather (under ~7°C) they cluster tightly to conserve energy and protect the queen and any brood in the colony. At higher temperatures the cluster breaks but they largely remain within the hive. After all, there’s little or no forage available, so they use their honey and pollen stores. The fat-bodied overwintering bees that are reared in autumn have a very different physiology to the ephemeral summer workers. The latter have a life-expectancy of 5-6 weeks whereas overwintering bees can live for many months 2. Throughout the winter there’s a slow and steady attrition of these workers. As they die off the clustered colony gradually reduces in volume, shrinking from the size of a medicine ball, to a football, to a grapefruit … you get the picture. Some brood rearing does occur. The queen often stops laying after the summer nectar flows stop 3 and laying might be sporadic through the autumn, dependent upon weather and forage availability. However, by the turn of the year she starts laying again. At a much reduced level to her maximum rate, but laying nevertheless and, with sufficient workers in the colony and as forage become available, this rate will increase. The amount of brood reared during the winter period (late autumn to early spring) isn’t enough to make up for the losses that occur through attrition. This explains why colonies are much smaller in the spring than the early autumn. Knowing what’s happening in the colony during the winter makes the requirements that must be met understandable. Strong colonies start the winter with ample bees. Assuming the same attrition rate, a larger colony will get through the winter stronger than a smaller one. There will be more workers available to ‘reach’ stores (I’ll deal with this in the next week or two) and keep the queen and brood warm. Hence there will be more foragers to exploit the early crocus, snowdrop and willow. Well-provisioned colonies have more than enough stores to survive the winter. The clustered colony will have to move relatively short distances to access the stores. 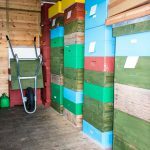 As a beekeeper, you won’t have to constantly meddle with the colony, lifting the lid and crownboard to add additional stores in midwinter. Weathertight colonies will be protected from draughts and damp 4.The hive must be weathertight and, preferably, not situated in a frost pocket or damp location 5. 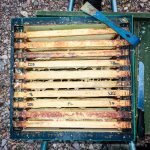 Once the honey supers are off all activities in the apiary are focused on ensuring that these four requirements for successful overwintering are achieved in a timely manner. Varroa treatment is started as early as reasonably possible with the intention of protecting the overwintering bees from the ravages of DWV. This means now, not early October. Use an appropriate treatment and use it correctly. Apiguard, oxalic acid (Api-Bioxal), Apivar etc. … all have been discussed extensively here previously. All are equivalently effective if used correctly. All colonies get at least one block (12.5kg) of bakers fondant, opened like a book and slapped (gently!) on the tops of the frames. An eke or an empty super provides the ‘headspace’ for the fondant block. All of the Varroa treatments listed above are compatible with this type of feeding simultaneously 7. Hopefully, hives are already weathertight and secure. Other than strapping them to the hive stands to survive winter gales there’s little to do. They think it’s all over!? They think it’s all over! is a quote by Kenneth Wolstenholme made in the closing stages of the 1966 World Cup final. Some fans had spilled onto the pitch just before Geoff Hurst scored the the last goal of the match (England beat West Germany 4-2 after extra time), which Wolstenholme announced with “It is now, it’s four!”. This was the only World Cup final England have reached, whereas Germany have won four. 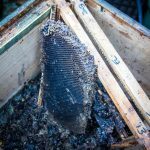 This entry was posted in Beekeeping, Diseases, Feeding, Principles, Seasonal and tagged autumn, winter preparations on August 24, 2018 by David. Beekeepers sweat, men perspire and women glow, or something pretty close to that, was an adage that originated in a Victorian etiquette guide 1. And, in the weather we’ve been enjoying recently, it’s not far from the truth. Even here on the East coast of Scotland we’ve had some long, hot and sunny days 2. It’s been perfect picnic weather, it’s made for a great Spring honey crop and it’s been purgatory doing colony inspections. The first one or two are fine, but I soon warm up. 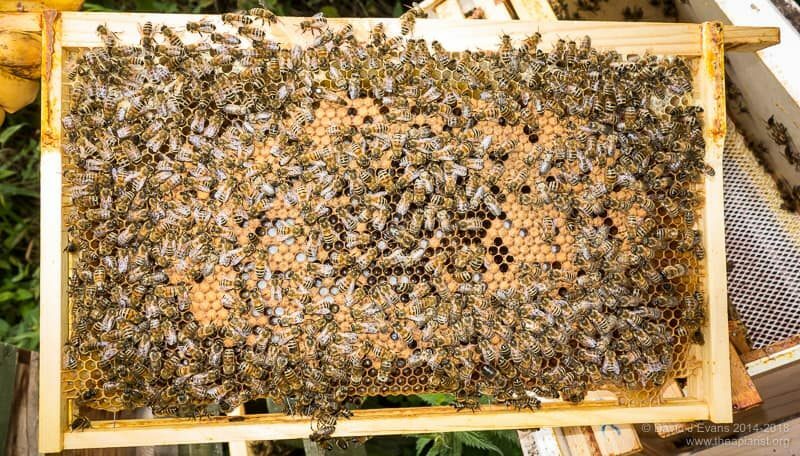 After half a dozen hives, particularly when shifting nectar-laden supers off and on, or setting up double-boxed splits, it starts to get uncomfortable. An hour or so later and it’s really grim 3. And it’s worse in the bee shed. The shelter and warmth that are so valuable on days with rubbish weather or at the extremes of the season, work against you in the heat of the summer. The temperature inside the shed regularly exceeds 30°C and, with no air movement, it can be stifling. What’s the best way to cope with the heat? Most of the major manufacturers make lightweight beesuits. I’ve got one from BBwear made from some sort of Teflon coated material. 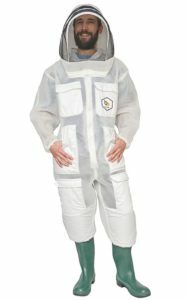 It’s certainly lightweight – about half the weight of my standard poly/cotton suit – but is saved for use when working in Varroa and disease-free areas. The relatively rare hot days we have don’t really justifying buying (yet) another full suit. BBwear have recently introduced their Ultra suit made from a ‘high tec fully ventilated 3D fabric’. At £359 (eke! 4) I’m unlikely to ever get to wear one 5, but I’d be very interested to hear of anyone who has experience of it. For quick inspections a jacket is cooler than a full suit … but during quick inspections you’re unlikely to work up much of a lather. The clothing you wear under the beesuit also has a big influence – shorts and a T-shirt are much better than jeans and a fleece. And if you need to wear a fleece under your beesuit to provide protection against stings it’s time to requeen the colony. Inspecting colonies under the heat of the midday sun can be hard work. 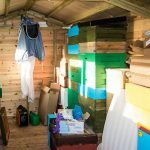 If time permits you could always inspect earlier or later in the day, or time your visit to the apiary so that the hives are in dappled shade rather than full sun. Work commitments mean I often have to conduct inspections late in the afternoon. On hot days it is usually cooler by 5pm, but by the time I’ve got round most of the colonies it can be getting quite late 6. Of course, as the day cools the hive fills with bees, making the important observation of the comb more difficult. This is compounded by fading light levels. 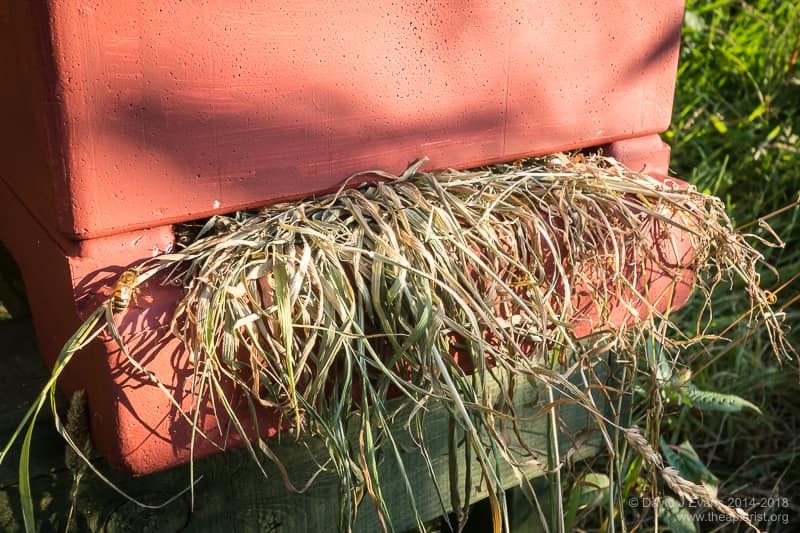 Given the choice – and I’m usually not – I’d probably prefer to inspect in mid-morning, once the bees are up and out, but without having to worry about running out of daylight or time. A headband is a very effective way to stop the sweat getting in your eyes, dripping off the end of your nose and splashing onto the inside of the veil. 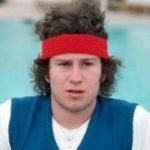 You might associate headbands (sweatbands) with tennis players or Mark Knopfler from Dire Straits, but they are just as much use to overheating beekeepers. Just remember to retrieve it from the pocket of your beesuit at the end of the afternoon, rather than leave it festering in there until the inspections the following week … a damp and slightly fetid headband not only doesn’t look good, it also doesn’t smell good. But it’s still very effective. The near-ubiquitous baseball cap provides almost as much perspiration-protection as the headband and probably has a little more sartorial elegance (not difficult). They have the added advantage that, on windy days, the peak prevents the veil blowing against your face at precisely the same time the one aggressive bee in the colony decides to make a kamikaze attack. Baseball caps work well under the ‘fencing veil’ hoods, but I cannot comment on their suitability for the wire-framed ‘retro’ hoods as these fit more closely to the crown (and I’ve never used one). 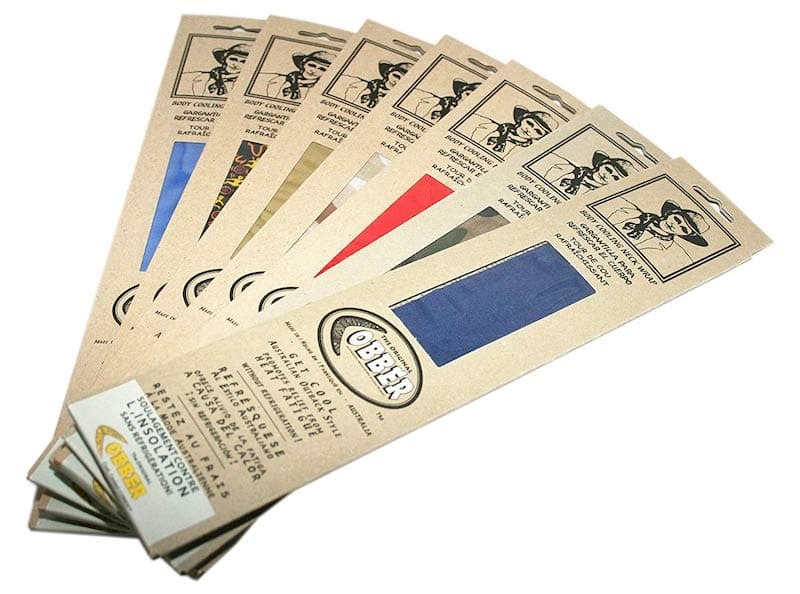 Cobber Enterprises make a neck scarf filled with water-absorbing gel granules. You soak it in water for ~15-25 minutes and wear it loosely tied around your neck (no surprises there). It works by evaporative cooling of the carotid arteries. I’ve had a couple of these for years 10 and have used them when walking in Southern Spain or Mallorca … and beekeeping. They need to be next to your skin and should be rotated periodically to find another cool patch. When writing this post I looked up the current pricing and availability of a Cobber. I was horrified to see they’re now over £20. However, you can dry them out and reuse them time and again. Mine appear to work as well now as they did when I got them about 15 years ago 11. 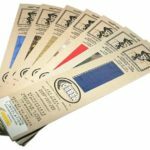 The beekeeping veil provides protection to keep any bad tempered bees from your sensitive lips, tongue and eyes. However, it doesn’t prevent you rehydrating as required … you can simply guzzle water from a bottle directly through the veil. This works very well and is very refreshing on a long hot afternoon in the apiary. However, stick to water only and avoid sticky, sugary drinks for obvious reasons. Drinking hot tea through the veil is possible, but not really recommended … not least because its ability to cool you be inducing sweating is probably negated by the fact you’re at least ‘glowing’ already. Of course, writing an article on good weather and beekeeping will more or less guarantee the rest of the summer is a wash-out. Sorry. I should add that “other beesuit suppliers are available”. I list BBwear as they’re the only suits I’m familiar with … I’ve bought about a dozen over the last decade for home or work and never seen the need to change. This entry was posted in Beekeeping, Seasonal and tagged dehydration, midsummer, overheating, sweat on June 29, 2018 by David. Finally, the winter appears to be receding and there’s pretty good evidence that the beekeeping season will shortly be starting. The early season pollen sources for the bees – snowdrops and crocus – are almost completely finished, but the willow is looking pretty good and the gorse is flowering well. Actually, gorse flowers quite well year-round, but it’s only now warm enough for the bees to access it. From an evolutionary point of view I’ve wondered why gorse ‘bothers’ to flower in mid-winter when there must be almost no pollinating insects about. 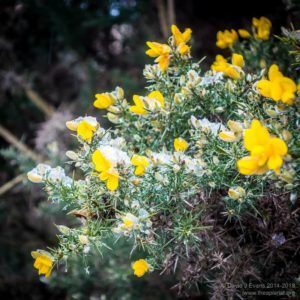 Of course, as Dobzhansky said in the 1970’s “Nothing in Biology Makes Sense Except in the Light of Evolution” … gorse flowers all year because there must be a selective advantage for it to do so. It turns out that it’s a little more complicated than me just being unable to observe winter-flying pollinating insects. Gorse probably flowers in midwinter for a couple of reasons. Firstly, there are winter-flying pollinators, at least on warmer days. Secondly, the flowers are a cunning design 1 that allows self-pollination, even when tightly closed on a cold, midwinter day when covered in snow. This probably explains the clonal expansion and invasiveness of the plant. Finally 2 weevils of the Exapion genus eat the seeds … by flowering, and subsequently setting seed in midwinter, the gorse can avoid the attention of the weevils, which need warmer weather 3. Winter-flowering in gorse is genetically-determined. A winter-flowering plant probably gives rise to progeny plants that also flower in winter. That was all a bit off-topic. However, it does explain the shocking pun used to head the previous section. Furze is another name for gorse, Ulex europaeus. 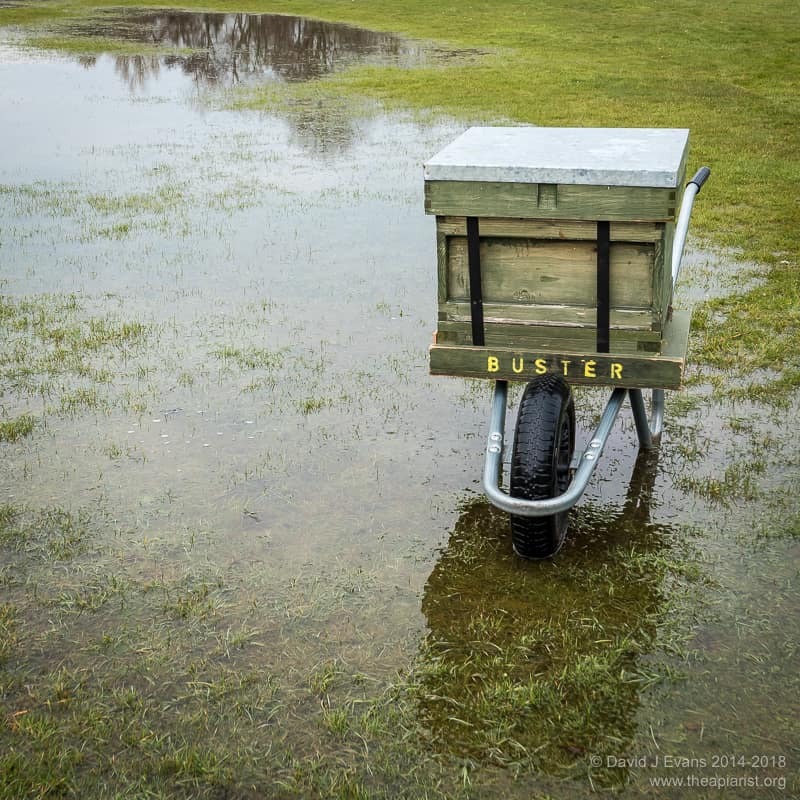 Inevitably we’ve had some April showers and the final bee moves over the last fortnight involved dodging the rain and wading through some minor flooding. Almost everything is now where it should be and – although perhaps a little later than usual – I can make some of the last-minute preparations for the season ahead. 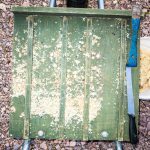 The beekeeping season in Scotland – or at least my beekeeping season – involves long periods of near-total inactivity interrupted by May and June, which are usually totally manic. This ~9 week period covers the major swarming season and the best time of the year to rear queens. Both can happen at other – generally later – times of the year, but the weather becomes a major influence on their success. The last two seasons have been characterised by rubbish weather in July and August, resulting in poorly mated late season queens. A consequence of the expected frenetic activity in May and June is that there’s no time to leisurely make up a few frames, or assemble a few supers. If they’re not ready now, they probably won’t ever be. I’ve therefore already built a couple of hundred frames and just have to fit the foundation into some of them. Many of the frames I use are foundationless, but a proportion still have foundation. The latter are useful to intersperse with foundationless to encourage the bees to draw parallel comb. Supers and frames with drawn comb are all safely stacked up from last season. Sometime over the next fortnight I’ll finish checking the last of these boxes over. Do they have a full set of frames? Are all the frames drawn? It’s irritating grabbing a box or two in the middle of a good nectar flow to find they only contain three frames, or it’s unwired thin foundation and unsuitable for the OSR. The other thing I do is tidy up wavy or bulging sections of drawn comb. 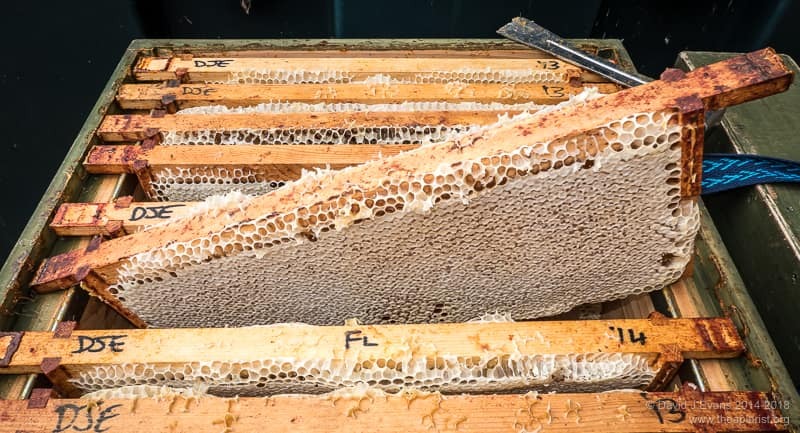 These are the frames that the bees have drawn out, maintaining bee space with the adjacent frame, but that leave gaping holes when put next to a different drawn comb 4. Life is too short to try and pair up the frames correctly 5. Instead I just use a sharp breadknife to make the comb reasonably parallel with the frame top bar. The bees tidy it up quickly and it certainly makes mixing and matching frames from different supers much easier. The other frame-related task is to go through the stacked up boxes of brood frames saved from last year. 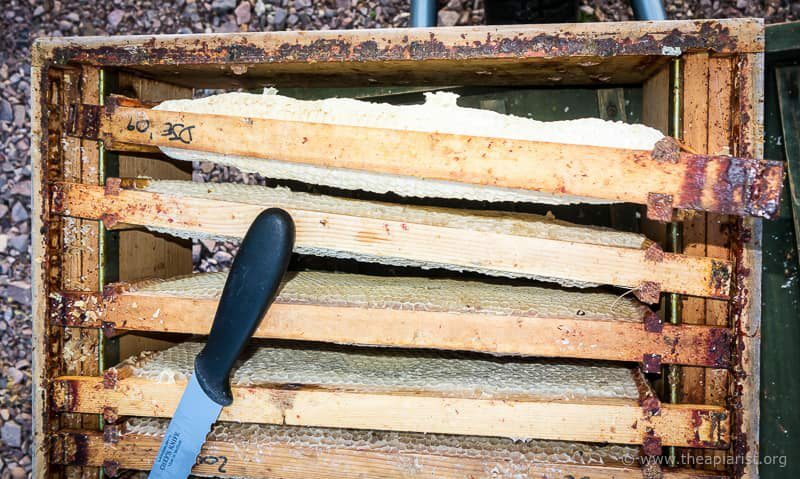 These, and the drawn super frames, are some of the most valuable resources a beekeeper has. 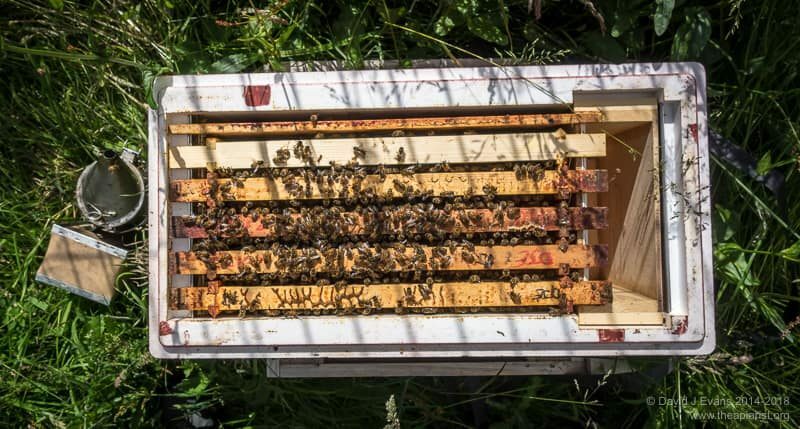 Assuming the frames are in good condition and there haven’t been too many rounds of brood reared in the frames they are invaluable when making up nucs during the season. Some of these brood frames will have inevitably contained nectar or uncapped honey at the end of the previous season. Over the winter this tends to ferment and make a bit of a mess. The nectar drips out unless the frames are held vertically. It can look bubbly or frothy and it pongs a bit (usually, and unsurprisingly, of yeast). I don’t like using these without cleaning them up a bit first. The bees usually clean up small amounts of fermented honey, but often ignore frames packed with the stuff. I shake out the fermented honey and soak the frames in a tub of water for a few minutes. I then shake out the water and leave them to air dry before storing them for the season ahead. This is the sort of job that needs to be done on a cool, dry day. If it’s warm you’ll likely be plagued with bees investigating the smell. Brood frames just containing capped honey can be used ‘as is’. The bees don’t cap it until the water content is low enough to stop fermentation. In contrast, the really old, black frames are either discarded outright or used for making up bait hives. There’s no point in trying to extract wax from them as there’s almost none left. Finally, the bee bag gets a spring clean. I empty everything out and chuck away all the rubbish that seems to accumulate during the season … the squeezed-together bits of brace comb, the torn nitrile gloves, the sheets of newspaper for uniting etc. 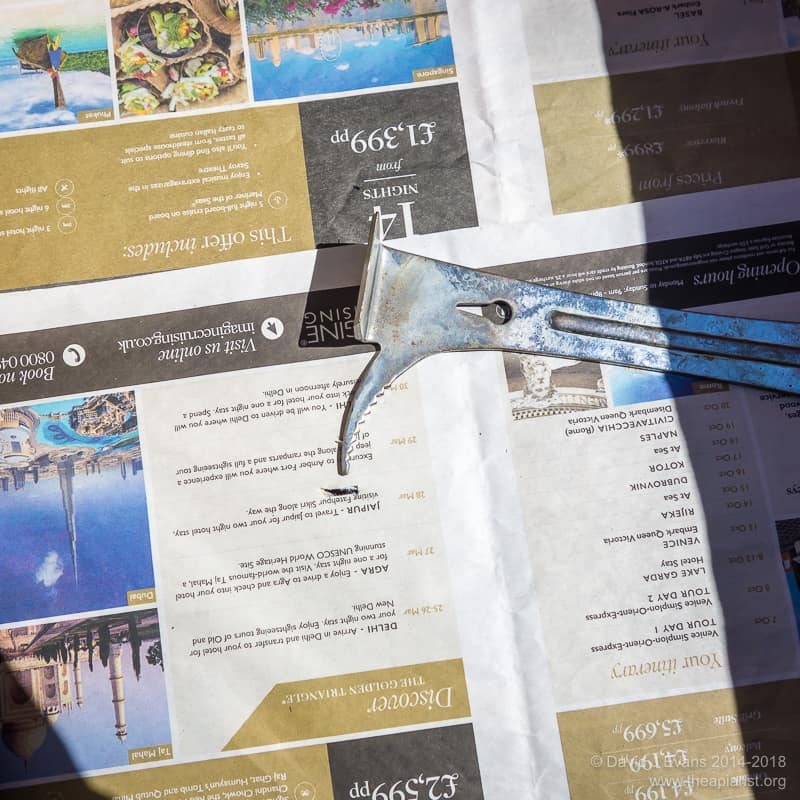 Everything goes back together in labelled ice-cream cartons (‘daily’, ‘queen rearing’), having checked they contain the essentials – sharp scissors, Posca marking pens and a queen marking cage, additional cages for queen introduction, grafting glasses and a sable paintbrush etc. I re-stock the honey bucket full of smoker fuel. This contains a mix of wood chip animal bedding, the lids of egg boxes not used to make firelighters and some lovely dried rotten wood. The smoker also gets its annual de-coke. Over the season you can get quite a build up of tarry, sooty deposits in the smoker, particularly on the inside of the lid. Using a blowtorch and a little encouragement from the pointed end of a hive tool it’s easy enough to clean all these out. 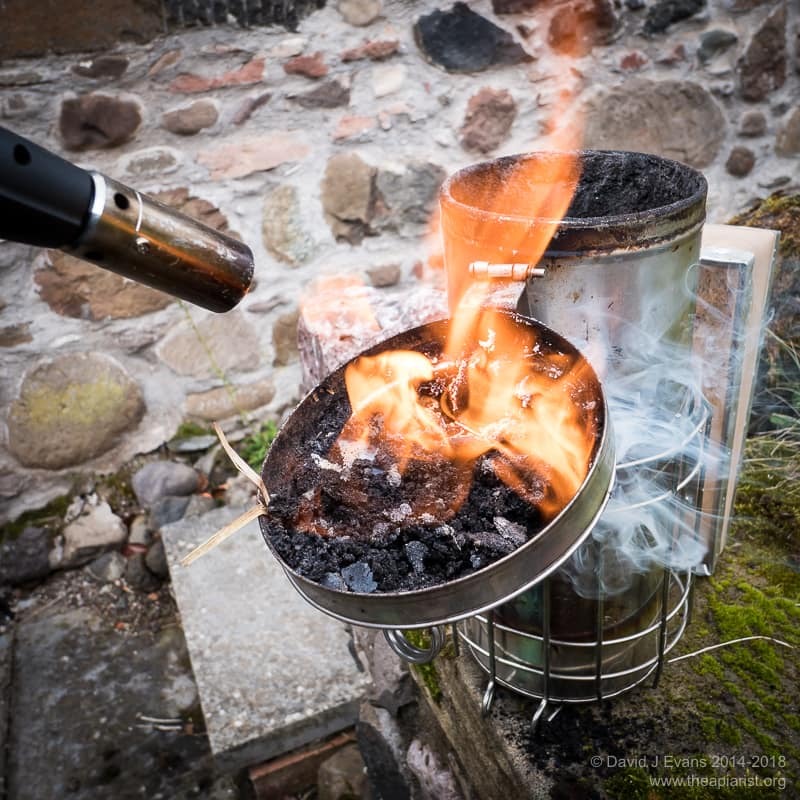 As a result, the smoker will stay lit longer and generally work better. This post was supposed to have been last week. However, a delayed flight meant I was stranded on the tarmac in ‘airplane’ mode when I should have been changing the scheduled posting date. D’oh! Instead “Let there be light“, which I’d written a couple of weeks ago and was already scheduled as a backup, snuck out. 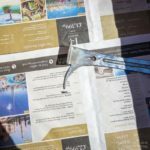 By the time it appears – the 20th of April – I expect to have conducted the first full set of inspections and I’ll be playing catch-up with the next couple of posts as the season kicks off. 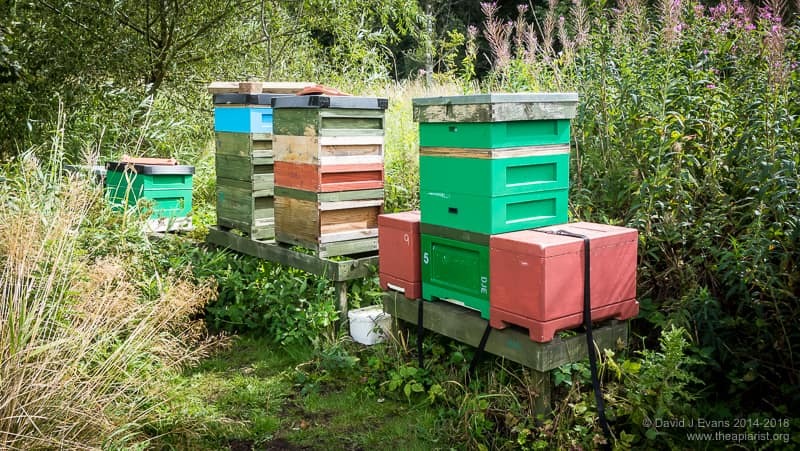 Stop press … with great weather over the latter part of the week I’ve got round my apiaries and inspected all colonies. With the exception of the two known duds, all are queenright and building up to varying extents … from OK to very well. The strongest will need supering this weekend. Considering how long and cold the winter has been – average temperatures November to March have been 3-4°C – this was encouraging and 3 weeks earlier than I got into some colonies in 2017. 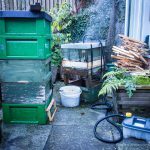 This entry was posted in Beekeeping, Efficiency, Seasonal and tagged fermenting honey, frame tidying, furze, gorse, smoker cleaning on April 20, 2018 by David.